If you have imperfect teeth but you worry about the issues associated with braces, then Invisalign can be a life-saver for you. Also known as clear aligners, Invisalign braces are virtually invisible, comfortable, and removable aligners that work as well as braces but without causing you any pain or discomfort. They are prepared with the help of 3D imaging technology and can work quite well. Why Do I Need Invisalign Braces? Invisalign clear aligners have a success rate of about 96%, however, they may not be suitable for very serious conditions. Get an appointment today and let our dentist perform a complete checkup to examine if Invisalign can be a good option for you or not. Call us to get an appointment. How Are They Different From Traditional Braces? Traditional braces are effective but they have huge drawbacks. They are made of metals and contain a wire that is visible when you talk, speak or smile. This can make people conscious and prevent them from fully enjoying their lives. Plus, traditional braces have to be worn at all hours and can be very painful as well, especially in the beginning. 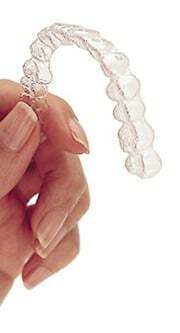 On the other hand, Invisalign clear aligners are made of plastic and hence are completely invisible. They can be removed as well and cause no pain or discomfort at all since they contain no wires or metals. The process is painless. Our dentist will take 3D images of the jaw to understand your mouth and to prepare a custom set of aligners for you. They are prepared in the lab and may take about a week to get ready. Once prepared, you can wear them without any issue and take the off as needed. However, for good results, they must be worn for about 22 hours a day. Our orthodontist will provide you with tips on how to care for your Invisalign and when to come for a follow-up appointment as changes may be required from time to time. Why Should I Choose Bobby Jivnani for Invisalign Braces in Texas? We perform many Invisalign procedures every year. We can accommodate a variety of budgets and financial situations. Call us to start your journey toward your very best smile!